Property 26: Brucoli Bay, relaxation in the villa, total comfort. View on the gulf and the volcano Etna. Property 27: A charming lodge in a garden nearby the sea. Property 31: "Lemon Cottage apt inside Villa Trabia - Villas for Rent in Bagheria, Sicilia, Italy"
Property 33: "Orange Cottage apt inside Villa Trabia - Villas for Rent in Bagheria, Sicilia, Italy"
We highly recommend a stay at this apartment. 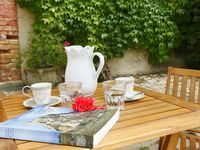 The rustic apartment is situated within a beautiful family run olive tree and wheat farming compound. The bedrooms were simple and comfortably furnished. The public rooms were full of local character and family collected art and curios . It was really nice coming home to a relaxing and quiet home after a long day of driving and touring. We wish we had spent more time exploring the olive groves and fields. The owner was very helpful with directions and suggestions and met us at the local market to allow us to buy groceries right way. It's hard to imagine a more relaxing environment.